We have learned much from reading and from others invested in missions. We read Bob Findley’s book The Future of Foreign Missions (1) which provides good evidence for using money for equipping nationals rather than sending Americans. Bob left China many years ago after asking the Christian Chinese what he could do to help them. They said “the best thing American missionaries could do for the spread of the gospel in China was to go home. They were making it appear as a bourgeois religion.” He then started raising funds to help equip nationals. It is amazing how the gospel spread in China after the American missionaries were expelled. Appearance of many American Christians in India also can make Christianity appear to be a foreign religion. 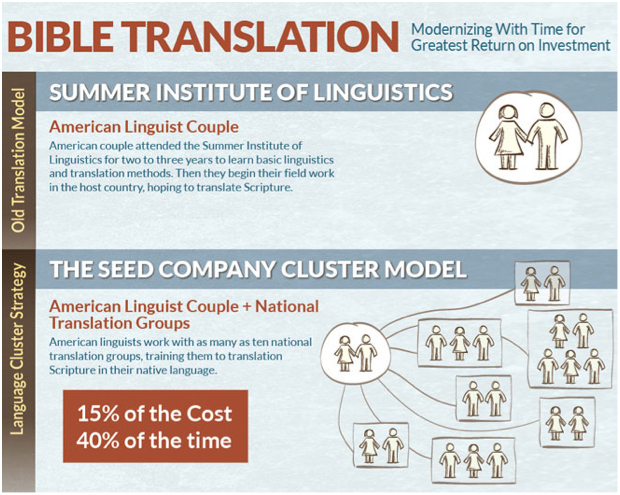 Changes have been occurring in Bible translation thru The Seed Company, an affiliate of Wycliffe Bible Translators, to bring the gospel to those who have not heard with 85% less cost and 60% less time thru nationals and a few Americans. Wycliffe started Bible translation many years ago with the first model shown of Summer Institute of Linguistics. About 15 years ago, The Seed Company was started. It is an offshoot of Wycliffe but still associated with it. Translation costs can be about 85% less and are completed in 60% less time. It uses a cluster model with SIL and national personnel in partnership. The new cloud sourcing or Crowd Seed shows promise to increase the speed and decrease the costs even further. In Lessons From The Sapling, Kurt Alan Ver Beek, (2) and the study of others, show almost no long term effects on most participants including giving. Since they often raised the money to go from others, they did not have extra to give for a national project after going. Ver Beek showed even giving usually did not increase after going. 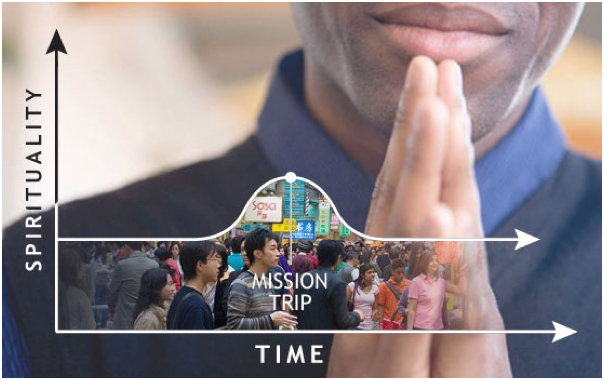 Many Christians believe that short term mission trips have a great effect on the participants. In Lessons From the Sapling by Ver Beek (2), and the study of others, show almost no long term effects on most participants. We have seen those who pay for their own trip and have extra money later give to the national missions they visited and continue to follow up. From my conversations with many of those who have gone on short term trips, I have not received confirmation that they then understand that most evangelism and discipleship is done by nationals. We have seen and heard of the complaints of the time and costs that short term trips by Americans have cost the national receiving groups. One large missionary-sending organization features an American in a monthly publication who is now serving in his THIRD country. (6) It takes years to learn the language and culture. Most new missionaries will not spend the time to learn the language before going and then may return before learning it. One mission organization worked in a country for many years. Their work included building churches. They did not realize this was an American centric rather than a national centric model until the nationals called to tell them that ‘your’ (the Americans’) church needed painting. In Majority World Sending in Perspectives, (7) authors in different areas of the world discuss how they are now sending their people to other countries to engage in missionary work. Today country A is sending missionaries to B, B to C, and C to A. I have not found this as a Biblical example and this raises the question of stewardship in high traveling and moving costs, plus the time and costs to learn a new language and culture. (1) Finley, Bob. The Future of Foreign Missions. 2003. Virginia. Christian Aid Missions. (2) Ver Beek, Kurt Alan. 2007. Lessons from the Sapling: Review of Quantitative Research on Short Term Missions. kverbeek@calvinedu. (3) Chapman, Gary. “Missions at Home.” Homelife. November 2008. SBC. p. 5. (5) Haaries, Jim The Effectiveness of Short-Term Mission to Africa, presented at U.S. Centre for World Missions on March 16, 2007. (7) Rajendran, K. Pgs 371-375. Majority World Sending. Indian Sending. Perspectives. US Center for World Missions. 2009. California. William Carey Library. (8) Wear, Jerry. “Kingdom Giving a New Perspective on Wealth.” 2010. Florida. The Great Commission Foundation of Campus Crusade for Christ.